A tsunami in the Bristol Channel could have caused the deaths of up to 2,000 people in one of Britain's greatest natural disasters, experts have said. 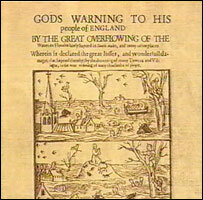 For centuries, it has been thought that the great flood of January 1607 was caused by high tides and severe storms. 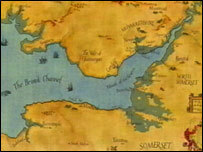 It is estimated 200 square miles (520 sq km) of land in south Wales and south west England were covered by water. 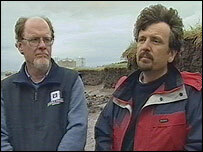 In a BBC Timewatch programme, two experts have argued a tsunami could have caused the devastation. Eyewitness accounts of the disaster, published in six different pamphlets of the time, told of "huge and mighty hills of water" advancing at a speed "faster than a greyhound can run" and only receding 10 days later. Professor Simon Haslett, from Bath Spa University College, said: "There is an overall theme running through the pamphlets of a destructive event, very violent, disastrous, on a scale that is unprecedented." Australian geologist Ted Bryant, from the University of Wollongong, agreed: "The waves are described as mountainous - that's a description of a tsunami." During the programme, Mr Haslett and Mr Bryant revealed evidence from all around the Severn Estuary backing up their theory. This included a layer of sand in mud deposits at Cardiff's Rumney Wharf, in which pebbles and pieces of broken-up shell can be found. They claimed that these deposits were brought in from the open ocean. And they argued that boulders lying on the shore in Dunraven Bay in south Wales could have been carried into their positions by the force of the onrushing waters. "Whether it is sand on the marsh, or it's pebbles in the clay, or it's erosion on the headland or boulders piled up in key spots, you go for the simplest explanation, and I can put down most of the signatures we have seen by one wave," said Mr Bryant. However, Dr Kevin Horsburgh, from the Proudman Oceanographic Laboratory in Liverpool, said some of the phenomena found could have been caused by a massive storm surge, formed by a combination of high tides and hurricane winds. "A storm surge is going to provide some billions tonnes of water rushing across the flood plain and is more than capable of picking up enormous rocks and large amounts of sediment and depositing them a long way away," he said. 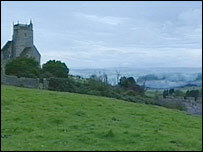 Dr Roger Musson, head of seismic hazards at the British Geological Survey, said there were other examples of earthquakes in the area caused by an ancient fault off south-west Ireland. One magnitude 4.5 earthquake was recorded there on 8 February 1980. "The idea of putting a large historical earthquake in this spot is not so fanciful," he said. "We know from seismological evidence, that we have actually had an earthquake here - so there is a fault and it is moving; it is active." Other UK tsunamis include a 70ft- (20m) high wave that hit Scotland 7,000 years ago, following a massive landslip in Norway. Three months ago, a tsunami triggered by a submarine earthquake near northern Indonesia killed nearly 300,000 people. The Killer Wave of 1607, a Timewatch special, was broadcast on BBC Two on Sunday 3 April.